George Washington, legend has it, danced in the ballroom of what is now part of The Inn at Little Washington, only back then he couldn’t have known that the town he laid out in 1749 would one day be anchored by one of the world’s most famous restaurants and inns. 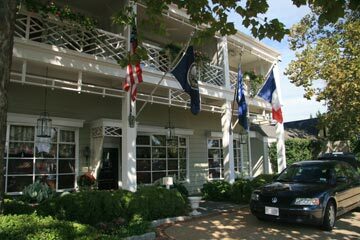 Here, gracing the corner of Middle and Main streets, its colorful flags rippling in the breeze, is the first restaurant and lodging establishment in the U.S. to achieve the Five Star, Five Diamond status for both its dining room and its lodging. Over the last three decades, The Inn at Little Washington has won one accolade after another including in 2016 the coveted 2-stars by the Michelin Guide. It also has been named Best Hotel Restaurant in the world by Travel & Leisure. The inn was selected to be a member of Relais & Chateaux, a distinguished group of 500 hotels and gourmet restaurants from around the world. Its chef and owner, Patrick O’Connell has been named Chef of the Year by the James Beard Foundation as well as countless others. 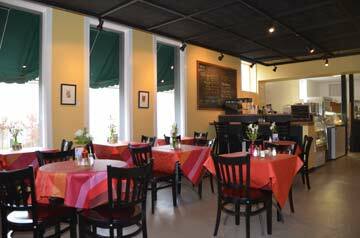 If it is homestyle cooking you crave, try The Country Cafe across the street from The Inn on Main Street. 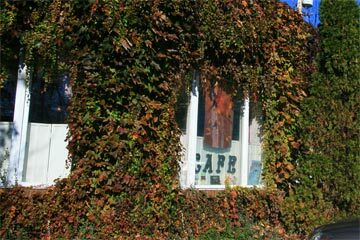 Located in an ivy-covered red brick building with a big picture window to watch the foot traffic, The Cafe is a favorite among locals. Don’t be surprised to see the person who dined next to you at The Inn the night before having lunch or dinner at The Cafe. 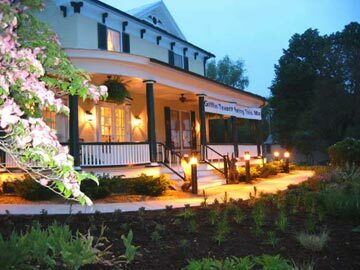 A couple of blocks south on Main Street is another culinary destination, The Foster Harris House, which serves exquisite six-course dinners on weekends and offers a mid-week menu to its overnight guests as well as the public in an intimate 10-seat dining room. On Gay Street, just across from both theatres, is Tula’s Restaurant & Bar, a delightful restaurant sought after by locals and visitors alike. Located at the corner of Gay and Jett streets, Tula’s menu features American Rustic Cuisine and its fine dining embraces the farm-to-table concept in a friendly atmosphere. Relax at the bar over cocktails, craft beers or wine or dine looking at the picturesque village through Tula’s big glass windows. Pet-friendly patio is popular in good weather. Down-home cooking at affordable prices. A local’s favorite for breakfast, lunch and dinner. Daily specials, fresh-made sandwiches and subs, hearty soups, mama’s homemade desserts, and good ‘ole southern hospitality await you in this cozy, family-owned restaurant. Washington, D.C.’s top rated restaurant in all categories in the Zagat Restaurant Survey. A member of Relais & Chateaux. Awarded Mobile Travel Guide’s Five Star and AAA’s Five Diamond awards. The dining rooms are a wondrous cocoon of luxury. The chef’s creations arrive course after course more dazzling than the last. Award winning 14,000 bottle wine cellar includes the finest offerings from Bordeaux, Burgundy, California and Virginia. Tula’s Restaurant and Bar offers rustic American food, exciting wines, craft beers, and fun with locals and visitors alike. Come join us and enjoy sophisticated country life at its best. Friday and Saturday evenings by reservation. The Foster Harris House invites you to enjoy seasonal culinary delights and experience a six-course dinner in an intimate, 10-seat dining room. The prix fixe menu changes weekly and highlights local ingredients. 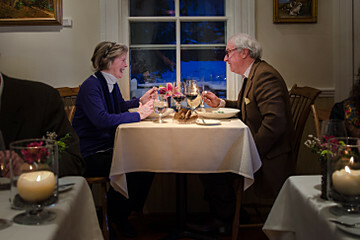 To make a reservation, please call Klaus at 540.675.3757 or book online at FosterHarris.com/Dinner.